Fall in love with Jesus all over again as you get to know Him through thirty-two of His life-changing names. These meditations by Nancy Leigh DeMoss, illuminated by the artwork of Timothy Botts and accompanied by quotes from classic authors, hymn writers, and preachers, will help you recapture the wonder of His name. 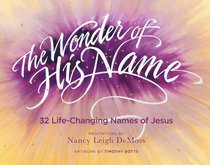 About "The Wonder of His Name"
NANCY LEIGH DEMOSS is the author of fifteen books, including the bestselling Lies Women Believe and Choosing Forgiveness. She is the host and teacher for Revive Our Hearts and Seeking Him, two nationally-syndicated programs heard each weekday on over 1,000 radio stations. Through her teaching ministry and books (which have sold more than two million copies), God is using her as a mentor and spiritual mother to thousands of women, and as a leader of the True Woman Movement. Nancy's burden is to call women to freedom, fullness, and fruitfulness in Christ and to see God ignite true revival in the hearts of His people. For more information on her radio programs, conference ministry, and books, visit www.ReviveOurHearts.com .